Hearty and delicious pigeon pea lentils cooked with coconut ground with garlic, cumin and chillies to make this Sadya Parippu Curry that is a staple in all Kerala Sadyas – a traditional feast. I love all lentil preparations, commonly called as dal in the northern part of India and parippu curry / saaru in the southern part of the country. If it is something from Kerala, it has to have coconut, not just some of it, but preferably in more than one form. This parippu curry has some grated coconut ground with spices and the seasoning is tempered in coconut oil. So so good for the soul! (at least for me!) This curry is usually made for Kerala Sadya (the traditional feast for festivals, weddings etc) but that doesn’t mean it has to stop you from making it any other day. What with the kind of rainy gloomy weather we have here in Seattle, I can easily settle down with a warm bowl of this and watch some TV (now, that totally depends on lil V). If you are interested in checking out other Sadya recipes, here is our collection of over 40 Kerala Sadya Recipes. 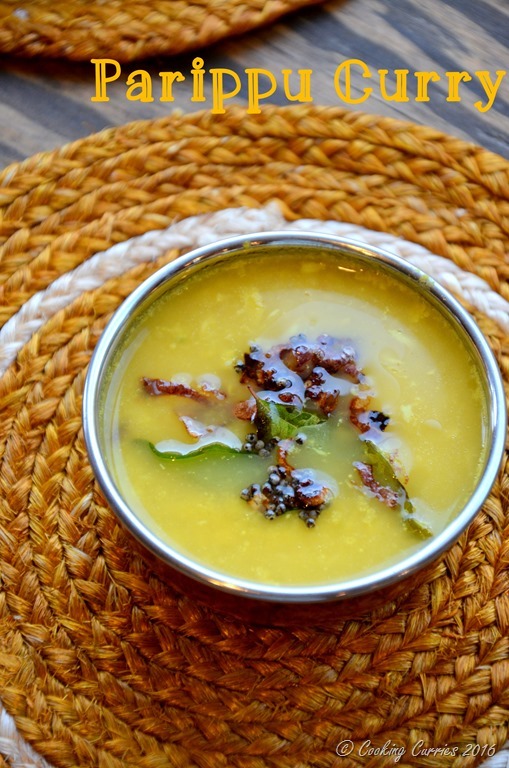 Split yellow moong dal or toor dal (pigeon peas) is used for this curry. 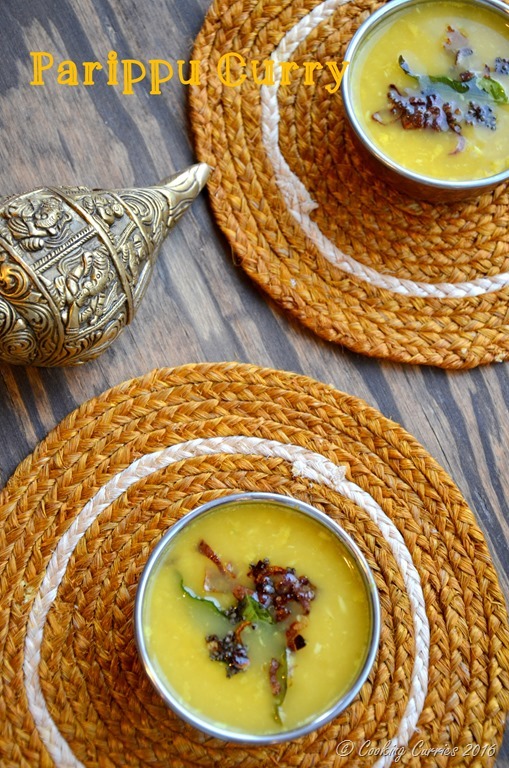 Cook the dal well with some turmeric ( a pressure cooker can make this an easy job for you). Grind grated coconut with cumin seeds, garlic, pearl onions and green and dried red chilis. Add this to your cooked dal mixture, add salt. Cook well and temper the seasonings and pour on top. Voila! Your soul mate for the cold season is here! Wash the dal well with water a few times. 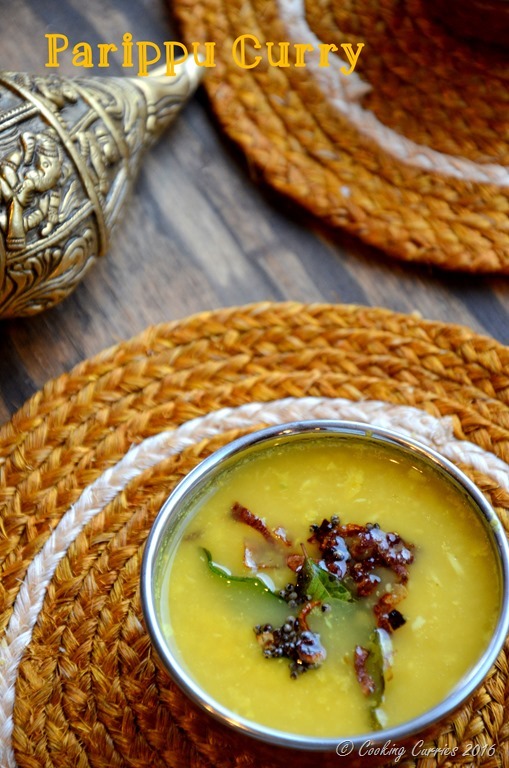 Cook the dal with the water and turmeric powder in a sauce pan or in a pressure cooker. Once done, add salt, mix well and keep on low heat. Add this to the dal mix, increase the heat to medium high and let it cook for a few minutes until the dal and the ground paste is mixed well. Now heat the coconut oil for the seasoning and add the mustard seeds to it. Once they splutter, add the onions. Once the onions turn light brown and a little crispy, add the curry leaves and the chilli. Pour this onto the dal mixture and mix well. Serve with rice, rotis or just as it is as a soup. Hearty and delicious pigeon pea lentils cooked with coconut ground with garlic, cumin and chillies to make this Sadya Parippu Curry that is a staple in all Kerala Sadyas - a traditional feast.